ONLY 15,694 Miles! Sunroof, Heated Seats, Navigation, Dual Zone A/C, Keyless Start, Captains Chairs, Alloy Wheels, PREMIUM PACKAGE, NAVIGATION SYSTEM PACKAGE, DYNAMIC RADAR CRUISE CONTROL, ACCESSORY PACKAGE 2. PREMIUM PACKAGE water repellent side windows, Blind Spot Monitor w/Rear Cross Traffic Alert, lane change assist, Driver Seat Memory, memory for three positions, Rain Sensing Wipers, Carbon Fiber Interior Trim, Speed Sensing Rear Spoiler, Park Assist, clearance and back sonar, Glove Box w/Key, CFRP carbon cloth, Electrochromic Auto-Dimming Outside Mirrors, reverse auto tilt, Heated & Vented Driver & Passenger Seats, NAVIGATION SYSTEM PACKAGE Electro Multi Vision (EMV) display and voice command casual-language voice recognition system and Lexus Insider, Lexus Enform, Lexus Enform App Suite (Bing, Yelp, iHeartRadio, Facebook Places, Movietickets.com, OpenTable, Pandora, Slacker, stocks, fuel prices and sports) and Lexus Enform Destinations (destination assist and edestination ), Back-Up Monitor w/Dynamic Grid Lines, Radio: AM/FM/In-Dash CD/DVD & Navigation, 10 speakers, Bluetooth 3.0 w/automatic phonebook download capabilities, HD Radio w/iTunes tagging and complimentary traffic and weather, MP3/WMA, dual USB/iPod audio input plugs and Siri Eyes Free, MOONROOF W/POWER TILT/SLIDE, DYNAMIC RADAR CRUISE CONTROL Pre-Collision System, ACCESSORY PACKAGE 2 Cargo Net, Carpet Trunk Mat, Rear Bumper Applique, Key Gloves, Alloy Wheel Locks. 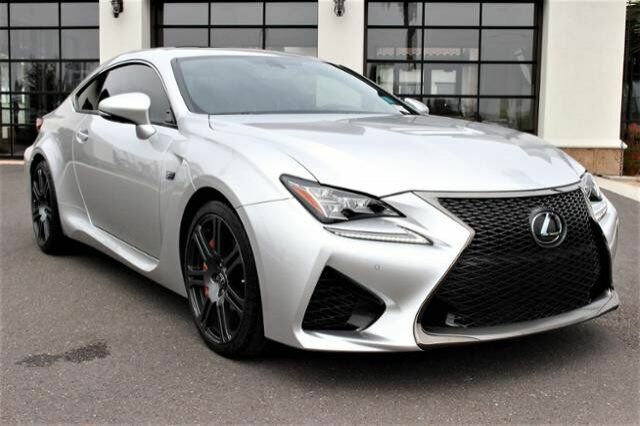 "If you're looking for a 4-passenger, 2-door sports coupe as expressive as it is reliable, Lexus' RC coupe for 2017 is the one to get." -KBB.com.